NEW Annual Catalog – Share the Fun! Today is the release day for the 2015-2016 Annual Catalog! If you haven’t checked it out yet then what are you waiting for! Click the Link to see all the amazing new items you can order now! remember that this code will close at 8pm CST on June 2nd, don’t miss out on getting new and old goodies shipped directly to you, and depending on how early you order in the day, they might even arrive before the weekend! Need something a bit more? Than consider joining my Team! Today we are kicking off a brand new Recruiting Promotion that is HUGE! HAVE A BIG WISH LIST? Purchase the $99 Starter Kit (kit includes up to $125 in your choice of current products and ships FREE) and join Stampin’ Up! between June 2 and June 30 AND choose ANY TWO stamp sets (any price) in the new catalog FREE. Learn more and join through me HERE! Just to give you a small taste, check out this little note card I created that will be a part of my Open House on Friday evening! I will be at Glory Days on 10th and Gage in Topeka from 6-8pm! We will be celebrating the NEW Annual Catalog by playing with new product and check out all that the NEW Annual Catalog has to offer. There will be Make and Takes, Samples, and giveaways! Don’t miss out! This note card features the fabulous new Ronald McDonald House Charities stamp set called Sprinkles of Life as well as the new Tree Builder Punch, Cherry On Top Designer Series Paper Pad, and the Watermelon Wonder 1″ Dotted Lace Ribbon – Yummy! I used all of the new 2015-2017 In Colors on this card by using the 2015-17 Stampin’ Write Makers. You will be seeing this stamp set many more times as I simply can’t seem to put it down! It was my first ‘must have‘ item from this catalog and I think you can probably see why once you check it out! Plus, with each Sprinkles of Life stamp set sold Stampin’ Up! will donate $3 to RMCH! A great stamp set for a wonderful cause! Thank you for dropping by my blog today, I hope you have an amazing day! jackie.diediker @ gmail.com. 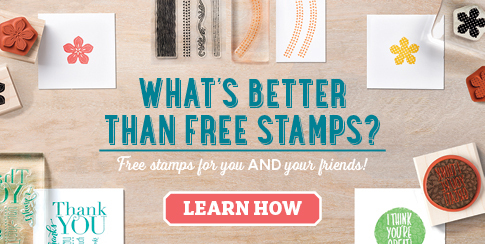 Order today at Stampin’ Jackie Shop! PreviousA Bit of Toting Fun! Pals Monthly Blog Hop – New Hues Review!